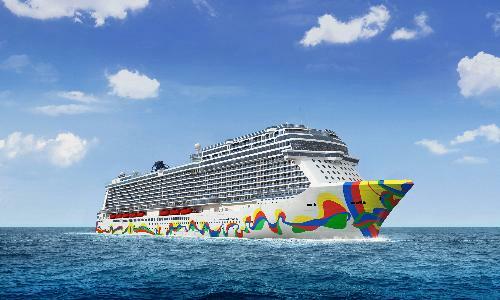 Norwegian Cruise Line revealed that Eduardo Arranz-Bravo, the award-winning Spanish artist, created the hull artwork for the fourth and final ship of its Breakaway-Plus class, Norwegian Encore, debuting in Miami in November 2019. A representation of his modern and abstract style, the ship’s hull will feature a labyrinth of color inspired by Arranz-Bravo’s life by the sea in Barcelona and pay tribute to the vibrant guest experience for which the Norwegian brand is recognized. Frank Del Rio, president and chief executive officer of Norwegian Cruise Line Holdings, played a key role in the selection of Arranz-Bravo as the hull artist for Norwegian Encore, having been inspired by his work for many years. Del Rio’s passion for the arts has helped elevate Norwegian’s on-board experience, most recently with the multi-million-dollar art collection curated for Norwegian Bliss.